Play and Learn Preschool provides a variety of hands-on activities with half day or full day options available. Children have daily practice in playing and working with others. Activities are planned for optimal growth and learning in the following areas: language and literacy, math, art and music, small and large motor development, problem solving, independence skills, and cooperation. Learning takes place within the context of purposeful play. Play and Learn Preschool helps nurture enthusiastic learners and prepare children for kindergarten. 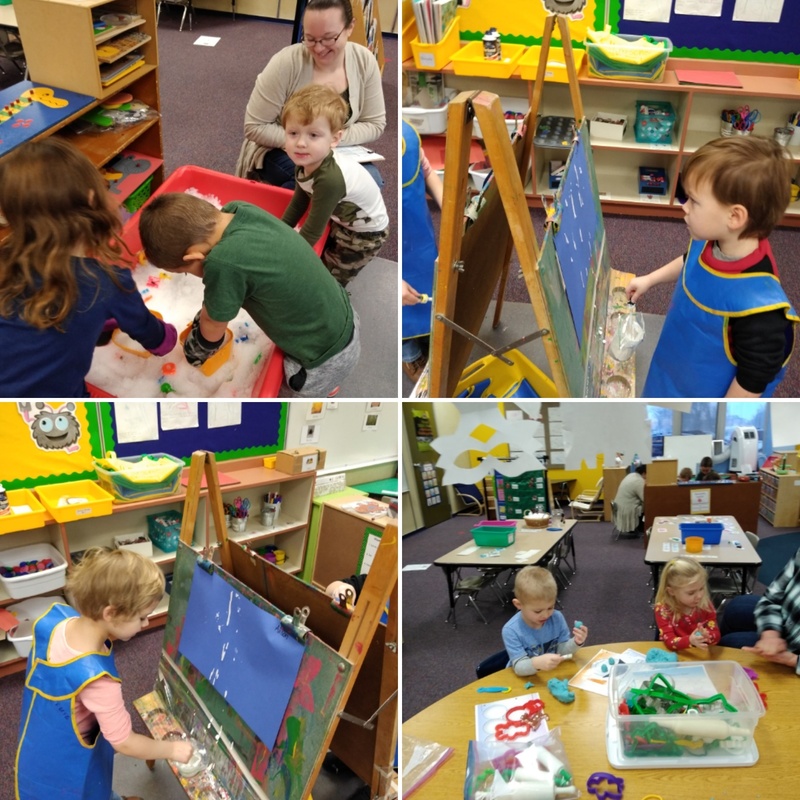 2019 - 2020 Preschool Registration is Now OPEN! We are excited to announce we will be offering ALL DAY preschool, 2 days per week this upcoming year for students who are 4 - 5 years old. We will continue to offer half day classes, two days per week for students ages 3 - 5 years old. You may download the 2019 - 2020 Preschool Registration Form below. Registration and class selection is based on need and first come, first serve basis. Scholarships and financial aid information is also available. Please contact the Early Childhood office to find out more information. 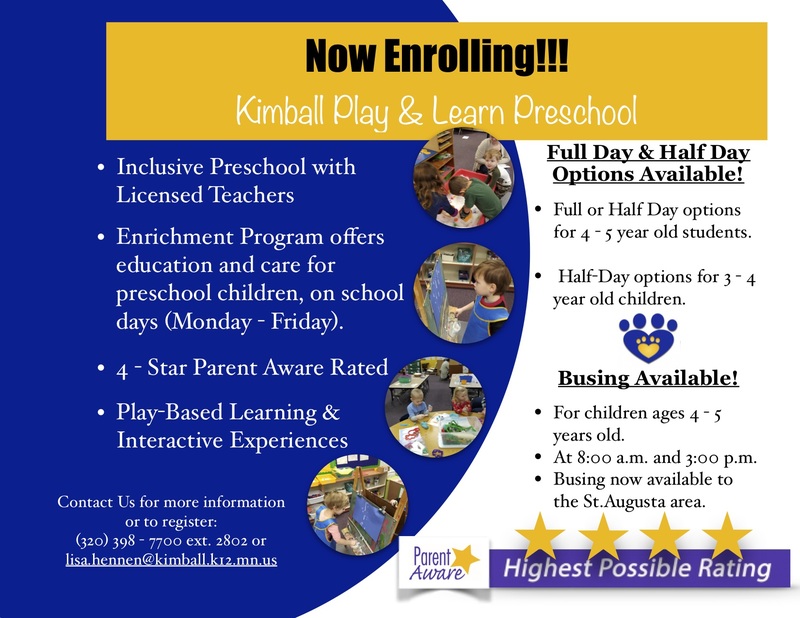 About our Program. . . .
Kimball’s Play & Learn Preschool is a 4 Star Parent Aware Rated program.Our classes are taught by licensed teachers who utilize the play-based learning to ignite young minds. Our program is fully inclusive and serves children of all abilities. Classes. . . . .
Young children who are age 3 (by Sept. 1st, 2019) are invited to participate in our Early Explorations class. This class is a half day class (2 hours and 45 minutes) for 2 days a week. Children who are age 4 (by Sept. 1st, 2019) are invited to participate in our school readiness classes. These classes are 2 days per week, and children have the option of attending either half days or full days. * Free-Choice (Teacher designed play based experiences to foster learning across all domains of development). Our teachers utilize Creative Curriculum and Teaching Strategies GOLD (a comprehensive learning assessment) to guide student learning. Our program also uses SEEDS of early learning to create a literacy-rich environment and experience for young students, along with Handwriting Without Tears to foster early writing skills. We use purposeful play, meaningful interactions, and carefully selected activities to help your child reach their highest potential. We want everyone to have the opportunity to a high-quality early education. We offer a sliding fee scale for tuition as well as Early Learning Scholarships. Kimball Play & Learn Preschool follows the District Calendar. Thank you for choosing Kimball Play and Learn Preschool.